A stone is placed at the point. Starting from the point, we cannot trace a path along grid lines to reach an empty point on the grid border through empty intersection points only. For example, to enclose 8 points on a 4x5 grid, we need at least 6 stones. One of many valid stone layouts is shown below. 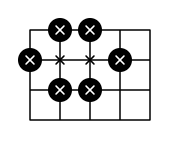 Enclosed points are marked with an "x". The first line of the input gives the number of test cases, T. T lines follow. Each test case is a line of three integers: N M K.
1 ≤ K ≤ N × M.
N × M ≤ 20. For each test case, output one line containing "Case #x: y", where x is the test case number (starting from 1) and y is the minimum number of stones needed.